1. Don’t give in– One of my friends once told me that the more sugar (or salt) you eat the more you crave it. This is so true. Once I start with Peanut M & M’s, I can’t stop, and I continue to crave them until they are completely out of my house. Don’t buy them, and you won’t be tempted as often. 2. Note your trigger foods– Take note by writing down what your “trigger” foods are. Then, stay away from them. Awareness will help you think twice when you crave your trigger foods. Keep your “trigger” foods at bay, and don’t bring them into your house or surroundings. 3. Stay in control– If you are surrounded by your trigger food at a party or at work, keep control. For example, if it’s a doughnut, take a small bite or portion if you must, and push the plate away when you’re done. 4. Eat protein along with fat (healthy fats)– Eating snacks that contain protein along with fat will keep you satisfied longer. If you’re craving ice cream or sugary desserts, opt for Greek yogurt with honey and nuts, reduced-fat cottage cheese or fresh vegetables with hummus. 5. Bake something healthy– I love to bake homemade granola or mini muffins to have on hand. Homemade fresh baked goods are a wonderful substitute for junk food. 6. Stay on schedule– Try to eat 3 meals a day and two healthy snacks, so you don’t get overly hungry. Staying on a schedule will help curb cravings. 7. Drink water and chew gum– A friend once told me this helped her stay away from eating while she was cooking. It helps when you have cravings too. 8. 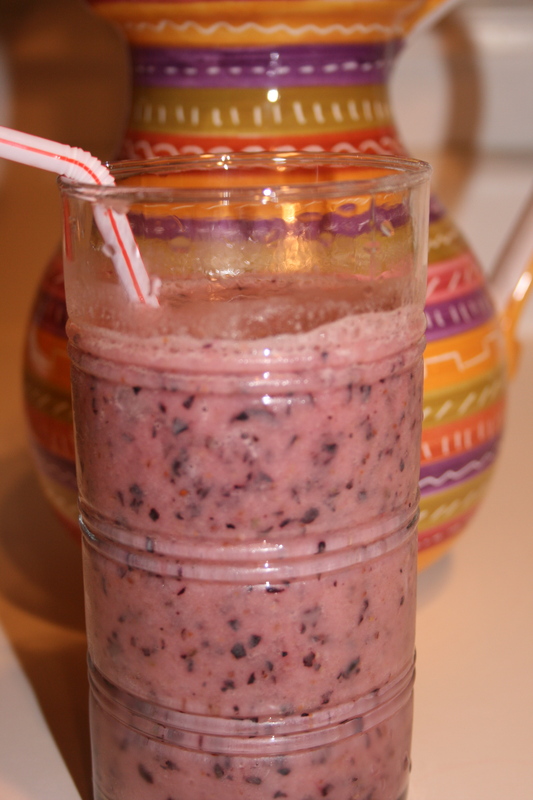 Make homemade smoothies– Use fresh fruit, fresh juice, Greek or low-fat yogurt to make fresh smoothies. These are a wonderful alternative to sugary desserts. 9. Drink green tea– Green tea is filled with so many healthy benefits. Substitute it for that afternoon soda, coffee or packaged snack (I need to do this more). 10. Don’t deprive yourself– Eat something healthy at the end of each meal or occasionally award yourself with a “splurge” meal. My friend, Sandra, brings dark chocolate to every lunch date we have. She eats it at the end of her meals so she satisfies her sweet tooth. Smoothies are very popular at my house. We make them several times a week, even in the wintertime for dessert, as an afternoon snack or for breakfast. My kids love to try new concoctions, which is great because we are always using fresh, healthy ingredients such as yogurt, fresh fruits and fresh juices not from concentrate. I am thrilled to indulge in smoothies as well as providing the kids with something so healthy that boosts energy levels, fills you up and makes you feel great. Sometimes I even sneak in a couple of tablespoons of wheat germ, crushed flaxseed, and they don’t even know it. Try this recipe or make one of your own as a fresh start to the New Year. 1. Combine all ingredients in an electric blender and process until smooth and frothy. Serve immediately.